Last night Rob and I had a feast fit for a King, which celebrated the season in a big way. Pheasants, parsnips, chestnuts; we had the best autumn has to offer. The meal felt very festive and would make a spectacular offering over the Christmas period. I bought the pheasants already prepared (thankfully!) from my local farm shop. Last time I cooked pheasant I casseroled it so this time I wanted to try roasting. It seems that the biggest concern when considering how to cook pheasant is preventing the birds from becoming dry, which they easily can. This is of particular concern when roasting pheasant. In order to prevent this I used plenty of butter and lay rashes of bacon over the breasts, and I basted the birds in the buttery juices half way through the cooking time. Finally I rested them for 10 minutes after cooking, breast side down to encourage the juices back into the breast. A few sprigs of thyme and a bay leaf inside each bird added good flavour, and a halved onion in the roasting tray along with some deglazing with white wine at the end of the cooking ensured delicious juices to pour over the birds. I served the pheasants with mashed potato to soak up the juices, and roasted parsnips. You can tell that the parsnips are in season just by looking at them, they are larger, creamier and fresher looking – really at their best. 1. Make sure the guts and other internal organs have been removed from the birds. 2. 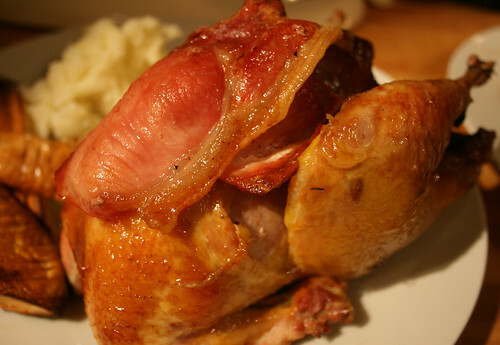 Smear butter generously over each bird and lay 2 bacon rashes across the top of each. Place a few sprigs of thyme and a bay leaf inside each cavity. 3. Place the birds in a roasting tray with a halved onion halved tucked just under each one. Put some tin foil over the tray and roast at 220c. 4. 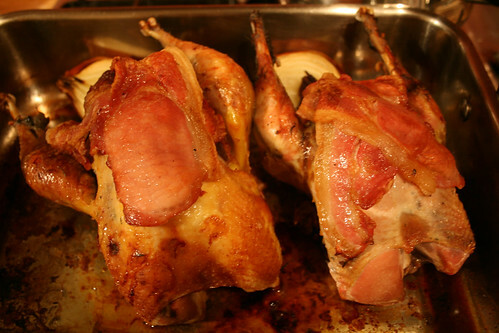 After 30 minutes remove the foil and baste each pheasant with the golden, buttery juices. Cook for a further 15-35 minutes without the foil, until cooked through. Note: the cooking time is just a guide as it will vary depending on size of birds. 5. When the birds are cooked remove them from the roasting tray and rest them breast side down for 10 minutes, covered in foil to keep them warm. 6. While the birds are resting remove any excess fat from the roasting tray and put the tray on the hob over a medium heat. Slosh in some white wine to deglaze the pan with, while scraping all the bits off the pan with a wooden spoon and stiring them into the juices. Remove the onion and pour the juices over the pheasants before serving. I wasn’t sure I could manage anything else after all that, but I’d been so looking forward to trying Hugh Fearnley-Whittingstall’s Chestnut and Chocolate Truffle Cake and not even my full tummy was going to stop me. I’ve watched Hugh make this cake on countless occasions, thanks to the River Cottage DVDs Rob and I have almost worn out. Each time I’ve marvelled at how seasonal and festive it is and told myself one day I will make it. 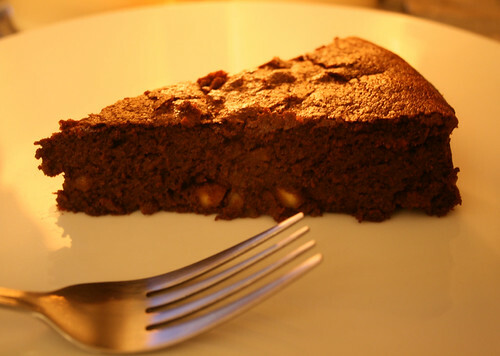 Although this cake can be made with canned chestnuts I wanted to roast my own this first time of making it, particularly as chestnuts are in season and available at the farm shop. 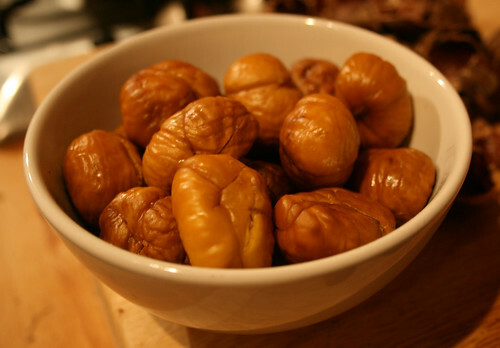 I found that these particular chestnuts weren’t quite as flavoursome or sweet as I’d hoped though, and that did reflect in the cake, so I’d say if your chestnuts aren’t so great you’re better off with canned. 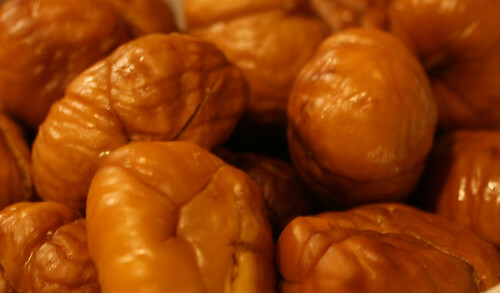 There’s been some pondering in the blogsphere recently on how to roast chestnuts. They can be tricky and the peeling can leave you with sore fingers but I still find them so worth it. Hot roasted chestnuts are so wintry and festive and I absolutely adore them, particularly bought from street sellers and eaten outside out of those little bags they put them in. The way I cooked the chestnuts last night was to cut a cross into the flat bottom of each (please do be careful when you do this, the skins are tough), and then to roast them at 220c for 30 minutes, by which time the shells start to peel back at the crosses and blacken a little. They are easiest to peel as hot as you can handle and they get harder as they cool. Having cooked them this way and peeling them whilst still hot I had no trouble at all, they just slipped out of their shells easy as anything. Hugh’s recipe requires 250g of peeled chestnuts, so I figured on cooking 500g of the uncooked chestnuts still in their shell. This gave me a nice handful for eating straight away too! 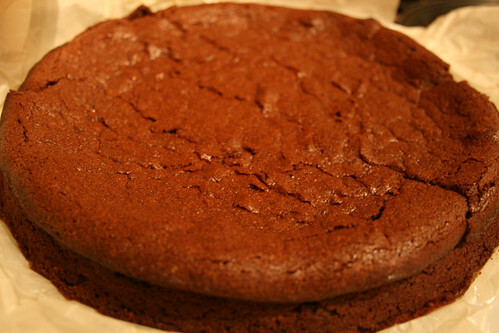 The cake itself was a doddle to make and cooked perfectly at the temperature and time the recipe specified. Warm from the oven the cake was light and mousy, just as Hugh promised, and it firms up as it cools, becoming quite like a chocolate brownie. It’s very rich and very chocolaty so perfect for real chocolate lovers. It’s a little on the rich side for me, but then I’m not a lover of dark chocolate. I think it would be delicious served warm as a pudding, with cold vanilla ice cream to cut through the chocolate. Previous Post In the Bag: Cooking the Month of November!